It’s the little things that make a big difference. The girl who works at the deli where I buy most of my food producing a little scrap of paper with Anna – New Zealand written on it so she could remember my name, being hugged by an Australian girl who works in the Aesop store after talking to her for over an hour about the highs and lows of San Francisco, receiving real mail in the post from friends scattered around the globe, finding a brand new, hard back copy of Janet Frame’s short stories for $6 at a tiny bookstore, or having coffee and pastries in the sunshine with Ollie before work on his birthday. I have also been thinking of little things in little jars. 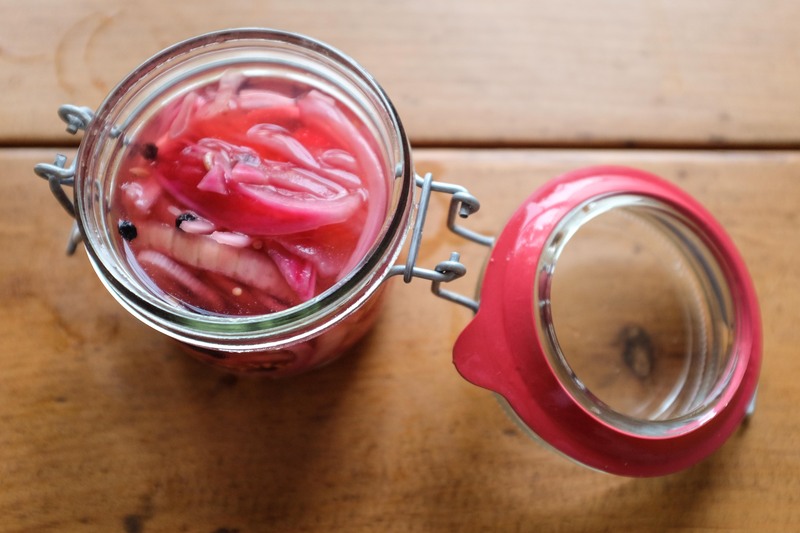 Pickling and jamming, if that is a word. I don’t think I have quite mastered the put things and jars and leave them for winter in the cupboard like a real cook, but they look pretty good in the fridge and taste good straight away. That’s the main thing, right? These measurements are just for a small jar, but you can adjust the qualities according to what you have. Simply bring your vinegar and water to the boil to combine the two, add everything else and pour over your finely sliced vegetables in a sterilised jar. Allow to cool and then pop in the fridge. Simple as that! I have done this with onion and radishes, both were delicious. I used red wine vinegar as I didn’t have any white, but I think this gives the vegetables a lovely rich colouring. These are a perfect addition to a salad, sandwich or a cheese and meat board. Then again, I would think so. Even as a toddler I loved gherkins and pickled onions and my father has been known to drink vinegar from the bottle when he thinks no one is watching. Salt and vinegar chips? Obviously the best flavour.